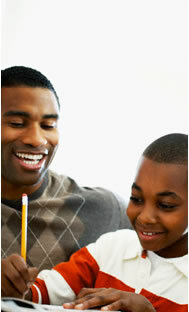 Are you a parent who appreciates the need to independently monitor your child's academic progress? To intervene if your child's progress is not what it should be? AWHomeTest is designed to empower you with high quality, convenient and inexpensive online assessments to monitor the development of your child's core academic skills. All of the assessments on AWHomeTest are rigorously designed by experts in the subject field and student testing. Each one also provides practical diagnostic information that you can use to help your elementary or middle grades student excel. ► Reading Measures OnLine (RMOL)SM is a 15-20 minute reading assessment available for grades 1 through 8. RMOL combines passages drawn classic literature, history and science with a research-based design. It addresses Oral Reading Fluency, including decoding (phonics) and expression, as well as Reading Comprehension. Included are optional instructional or practice activities that you (or a tutor) can use to target particular skills. More information is available here. ► Arithmetic Testing OnLine (ATOL)SM is a 30-45 minute assessment of essential arithmetic skills at grades 3 through 6. ATOL was developed by top university mathematicians working with skilled teachers. Use it find out if your child is on track and being prepared for success in a challenging Algebra I class by the eighth or ninth grade. Reports include detailed information on where your child needs to improve. More information is available here. Create a parent account by using the "Click here to sign up" link in the Parent Login Area (on the left side of this page). Remember to enter to ENTER the PROMOTIONAL CODE on this sign up page. Once you are logged in, create a student username and password for your child. Assign your child a test from the Catalog. You can do so by clicking on the “Assign a Test” link in the top right corner. Your child can then take the test you assigned at any time. No purchase is required until you assign a test to your child. Creating your account is free. Are you part of a parent organization or network that includes at least 25 households? E-mail us here for introductory discounts up to 15%.